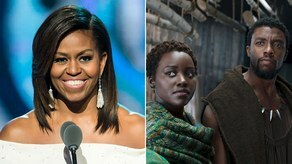 Black Panther continued to shatter records, change lives, and receive rave reviews over the weekend, with one such review from none other than Michelle Obama. On Presidents' Day, the former First Lady of the United States took to Twitter with high praise for the acclaimed masterpiece, congratulating the filmmakers for its groundbreaking effect on superhero movies. "Congrats to the entire #blackpanther team!" she tweeted. "Because of you, young people will finally see superheroes that look like them on the big screen. I loved this movie and I know it will inspire people of all backgrounds to dig deep and find the courage to be heroes of their own stories." The former First Lady makes a very important point about just how much representation matters in media. As she points out, getting to see heroes who look like you on the big screen goes a long way in breaking barriers. Plus, the success of inclusive films like Black Panther and Wonder Woman make the case for studios to fund even more films like them, instead of ones with questionable representation and whitewashing. Obama's tweet has since (obviously) gone viral, and even caught the attention of Wakandan royalty themselves. Lupita Nyong'o, who plays Nakia in the film, retweeted the praise, adding, "Humbled by the real queen 🙅🏿‍." Aside from the fact that this obviously means the Obamas need cameos in Black Panther 2, it's amazing to see the ode to black excellence continue to get the recognition it deserves — and from someone as monumental as Michelle Obama, no less. Meanwhile, former President of the United States Barack Obama hasn't yet shared his thoughts on Black Panther, but considering his lifelong interest in superhero comics, it wouldn't be surprising if he loved it just as much as his wife.